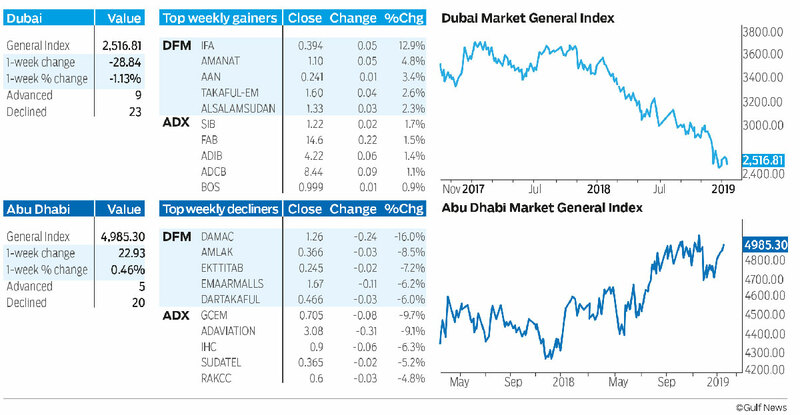 Dubai: Although the Dubai Financial Market General Index (DFMGI) was down last week, falling by 28.84 or 1.13 per cent to end at 2,516.81, there is a pattern forming that could provide some optimism soon. The decline was joined by a majority of listings, as there were 23 declining issues and only nine advancing. Even though price fell, volume also dropped to a 19-week low, reflecting little enthusiasm from sellers. Rather than continuing a prior two-week advance, which started to create a series of higher weekly highs and higher weekly lows (uptrend), the DFMGI instead decided to test recent lows. Four weeks ago the DFMGI hit a trend low of 2,429.22, and then rallied the subsequent two weeks, generating the beginning of a potential uptrend. Last week the index weakened to a low of 2,479.37, thereby falling below the previous week’s low of 2,520.87 and violating the developing trend pattern. Moreover, the week closed below the prior week’s low. By themselves, each of these signs are bearish in the short-term. Nevertheless, bottoms can take some time to evolve and price usually doesn’t just reverse and go straight up. Despite last week’s weakness, the chart pattern now present in the daily chart of the DFMGI, is that of a potential head and shoulders bottom. This is a classic and relatively common bullish trend reversal pattern that can improve the odds of success of a reversal once confirmed. As with all chart patterns, a breakout trigger is needed before the pattern is confirmed to be valid. Until then, the formation can fail or morph into a different pattern altogether. This pattern in the DFMGI formed its right shoulder at last weeks low, with the head of the pattern at the recent downtrend low. A breakout signal is given on a decisive move above the most recent swing high of 2,561.01 on the daily chart (last week’s high), and it is confirmed on a daily close above that price pivot. If a breakout does occur, how far might the DFMGI go? First, we can take a look at a potential target based on the measuring objective of the head and shoulders bottom pattern. For this, we measure the height of the pattern and then add the price distance to the breakout level. In this case, we would then arrive at a minimum price target of approximately 2,716.80. That price level would bring the index right up into the bottom area of a consolidation zone noted in prior weeks in this column. The consolidation pattern starts around 2,706.57 and goes up to the previous high 2,854.49. Also, around the pattern target is a downtrend line, which represents potential resistance. That line starts off the January 2018 swing high. Last week the Abu Dhabi Securities Exchange General Index (ADI) gained 22.93 or 0.46 per cent to end at 4,985.30. Even as the index rose, most issues did not participate in the strength, as there were only five advancing and 20 declining. Meanwhile, weekly volume fell to a 20-week low. The advance off the recent 4,762.60 pullback low continued last week as the index moved into the third consecutive week of higher weekly highs and higher weekly lows. In addition, last week’s close was above the prior week’s high of 4,962.80. Further, last week’s low of 4,957.86 found support around the prior week’s high. In other words, strength kept the ADI from pulling back into the range of the previous week. These are bullish signs. At the same time, upward momentum has diminished as each of last week’s five trading days occurred within a tight range, creating a narrow-range weekly pattern as opposed to appreciation of price. Also, the week’s close was below the fifty per cent level of the week’s high-to-low range. A close closer to the week’s high would show greater conviction. These behaviour patterns occur within an already risky zone of consolidation (potential resistance) that formed from late-August to November 2018. Once upward momentum declines, the chance for some degree of a pullback improves. A drop below last week’s low will point to a deeper pullback. This could lead to the ADI heading towards weekly support around 4,894, and possibly down to approximately 4,819.16, which is the three-week low. There are a couple potentially bullish patterns in Emirate Integrated Telecom (Du). Last week the stock was the sixth best performer in the Dubai market, rising 0.06 or 1.2 per cent to close at 5.06. During the week, Du got as high as 5.07, providing the first sign for a potential breakout of a tight seven-week consolidation range. Within the range is a series of higher lows over the past six weeks, including last week, where the week’s low of 5.01 was noticeably above the low of each of the prior seven weeks, showing strength coming into the market. At the same time, there is a larger potential head and shoulders bottom pattern forming. A bullish breakout occurs on a move above the September high of 5.19, with a minimum target from the pattern of around 5.68. Meanwhile, support of the right shoulder is at the 10-week low of 4.88. A drop below that price will invalidate the pattern. Bruce Powers, CMT, is a technical analyst and global market strategist.